There has been a lot of media coverage in the news lately about the drought in the US. My colleague Michael Roberts has blogged extensively about this. Here's another way to look at this: Michael and I have written a paper that looks at how weather impacts corn yields (Here's a link for those interested in reading more). We found that degree days above 29C (84F) is the best predictor of yields. Degree days are just a truncated temperature variable that only counts temperatures above 84F for each day of the growing season. All temperatures below 29C (84F) count as zero, while temperatures above 84F get counted as the difference to 29C (e.g., a temperature of 30C gives 1 degree day, a temperature of 31 gives 2, etc). We then sum this measure over all days of the growing season, which we set at March 1 - August 31st. 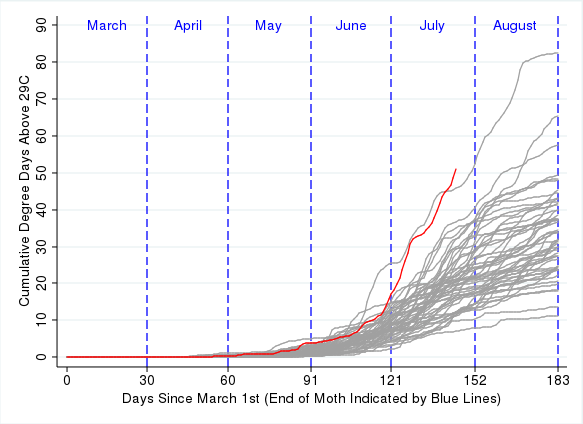 The following graph gives an update for 2012 that runs through July 23rd (red line). It shows the cumulative sum over time (summing all days from March 1st until the current day). The grey lines are historic data for the 52 years 1960-2011. July has indeed been very hot: the red line has taken off. There are only three years on record where the season total at the end of the August was higher than what we have experienced this year already by July 23rd (since this is the cumulative sum, a line can only go up): These were 1980, 1983, and 1988 (the historic maximum was 1988). We'll have to see what the rest of July and August will look like. If you are wondering how this compares to projections found in climate models: well, they predict a lot more warming. Since degree days are truncated, even moderate increases in temperatures can lead to a very large relative increases in degree days. Finally, what is the impact on yields? If you believe our model, each degree day above 29C on average decreases yields by roughly 0.7%. The historic average season total is 34, and we already reached 51 this year, meaning that yields should be 12% below normal for the US. That is assuming that we won't go above 84F for the rest of July or August,which seems unlikely, so the end result should be even lower. Technical notes: The degree day measure shown is averaged over the entire United States. We follow a three step procedure: (i) construct a daily measure of minimum and maximum temperature on a 2.5x2.5 mile grid as outlined here; (ii) Average all grids in a county by the cropland area in a grid; (iii) average all counties using expected production along a trend as weights (An impact on high-production areas impacts national yields more).